Web Series Today: IAWTV Board Elections: What went wrong? 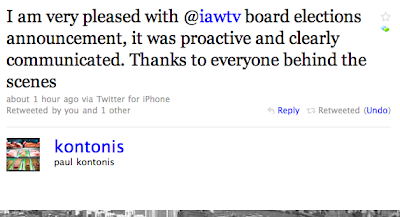 IAWTV Board Elections: What went wrong? So glad the @iawtv board got out in front of this technical issue with the election. I'm confident we can address the tech and move forward. "It was announced this morning that due to flaws discovered in the IAWTV online voting system for the Board of Directors elections, the current election process was nullified and a new election process will take place from the beginning. " I think it was a technical issue and once they had been notified of it and realised the possible implications, this was the best response. I don't think there is any evidence of wrong doing on anyone's part - this is to make sure there can be no suspicion of that. 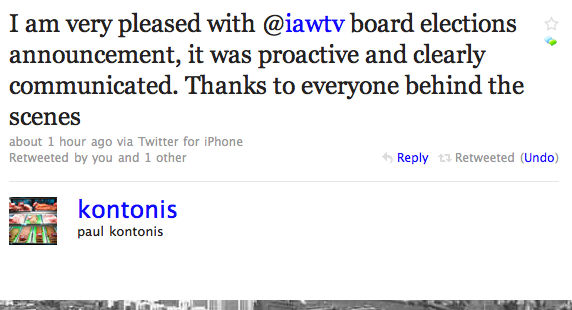 See also: IAWTV: Voting for the Board ends Friday - why it matters! ...to repeat history if we don't remember it. What I did notice was that last Friday Blip.TV featured a number of web series from individuals who appear to also be voting members for the IAWTV Board. Given that one of the founders of Blip.tv is running for the Board of the IAWTV one has to ask if this action could have affected the election. The "features" seemed unusual at the time and did generated a lot of Twitter-Love for Blip.tv over the period when the election was still in play. Blip.TV is an independent company and does not appear to have broken any IAWTV rules. However they must have known that this could have had the appearance of trying to influence the results of a highly sensitive election. Looks like there were in fact some technical issues and that has caused a re-vote. "There are of course a lot more discussions that may spring out of this, including the fact that the flaws in the system were discovered in part by someone taking the time to try to cheat the system in the first place." We shouldn't be surprised. Entire careers have been launched off of series with cheated view counts why wouldn't that philosophy permeate the IAWTV elections? Disgraceful but hardly surprising. solicitation of votes by candidates, and the use of membership lists for such purpose." For me it's no big deal, they just need a full time tech person to troubleshoot this stuff is all. Well, clearly they need a full proof voting system if they are going to use the same system for their awards show. i guess my 5,000 votes for tom konkle were discovered. Perhaps if the IAWTV is going to hold new elections for their Board of Directors they should seriously consider what guidelines should be in place to prevent the election being influenced by those in positions of power. This might help avoid incidents such as the one mentioned before with Blip.tv which while not breaking the current rules does raise a lot of troubling questions. Also, as stated in their own By Laws perhaps they should also consider what types of vote solicitation are appropriate. I'm sure lots of these things are being looked out now. The format for the new election hasn't been announced yet, so we'll have to see what happens. Worldofhiglet, one can only hope so. This gives the entire membership an opportunity to ensure that the elections are held in a way that is fair and impartial. If "life" gives you lemons, make "lemonade"...... so, this is a second chance to get things right and eliminate in advance what could be seen as a problem down the line.